Presidential elections were held in Cape Verde on August 7 and 21. Cape Verde is an African archipelago composed of ten islands off the coast of West Africa (Guinea-Bissau). The former Portuguese colony gained independence from Portugal in 1975, and was ruled from that point till 1991 by Aristides Pereira as a single-party socialist state centered around the left-wing African Party of Independence of Cape Verde (PAICV, ex-PAIGC). However, in 1991, Pereira opened to system to democracy and in a wonderful example of democratic transition of power, he handed power over to António Mascarenhas Monteiro of the liberal opposition Movement for Democracy (MPD) after losing the first free elections in a landslide to Monteiro. The liberal MPD ruled until 2001, when Pedro Pires – Pereira’s former PM and the candidate of the left-wing PAICV – defeated MPD Prime Minister Carlos Veiga by a mere twelve votes. Pires was reelected in 2006 by a 3000 vote margin against Veiga and was due to retire this year. The PAICV won legislative elections in February, taking 51% of the vote to the MPD’s 42%. Cape Verde’s economy is strong: GDP growth was 5.5% this year and is projected to reach 6.8% next year. In addition, unemployment has been slowly declining and Cape Verde’s poverty rate has been halved compared to 1990 level. The country still faces many challenges, and poverty is not eradicated, but thanks to tourism and foreign remittances from emigrants, the economy is doing well. It can also be proud of its strong democracy: it is one of the freest and most democratic nations in Africa: it has a 7.94 on the Democracy Index – flawed democracy – but that is better than Greece, Italy, France, Israel or Brazil. The PAICV split ahead of the election: the party officially nominated former foreign minister Manuel Inocêncio Sousa, but the speaker of the National Assembly, Aristides Lima ran as an independent with the support of part of the PAICV. The MPD nominated Jorge Carlos Fonseca, a former foreign minister and independent candidate for President in 2001 (he did poorly). Some independent named Joaquim Monteiro also ran. In the first round, the MPD’s Fonseca won 37.3%, followed by Manuel Inocêncio Sousa at 32% and Lima with 27.4%. Aristides Lima bowed out of the race gracefully but did not endorse any candidate, pointing to bad blood between the PAICV candidates. He instead talked about how far his candidacy had gotten despite alleged biased or unequal media coverage. Fonseca apparently benefited from the support of most of Aristides Lima’s voters, and perhaps from a campaign which apparently stressed how independent he was and how he would not be the president of any one party. Fonseca’s victory was a blow to the PAICV leadership and Prime Minister José Maria Neves (PAICV leader and PM since 2001), but both welcomed his victory quite gracefully and hailed it as a great democratic moment. With the PAICV holding a majority in the legislature, Fonseca will likely have to stick with José Maria Neves as Prime Minister, the first such cohabitation between the MPD and PAICV in Cape Verdean institutions since democratization in 1991. Given that both parties are actually rather similar in practice, both, for example, being supportive of the market economy (to varying extents, of course), it shouldn’t be wracked by too many disagreements. Manuel Inocêncio Sousa carried the emigrant vote with 54%, doing best with Cape Verdeans in Africa (67%) and the Americas (59%) rather than those in Europe (47%). 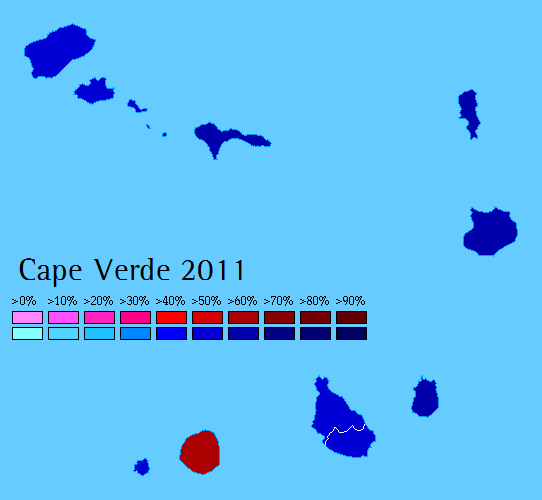 However, in Cape Verde, Fonseca carried all but one of the ten main islands in the archipelago. He won his best results in the eastern Barlavento Islands and Maio, which are economically dependent on salt (and tourism to a lesser extent). He only lost Fogo (by a lot – he took 39.9% there), which is a volcanic agricultural island. Agricultural islands are traditionally more favourable to the PAICV than salt islands, which tend to favour the liberal MPD. Yet, Fonseca carried most of these agricultural islands as well, although not with the huge margins he carried the salt islands with. Start reading my Guide to the 2011 Spanish Elections, all you’ve ever wanted to know and more about Spanish history, political issues, political parties, regions and more in one huge thing. Still under permanent construction. Primary elections for a plethora of offices, the most important being President, were held in Argentina on August 14. Other offices also affected by these primaries were deputies, senators, mayors and governors. These simultaneous, open and mandatory primaries as they were called are the first open primary elections to be held in Argentina. The theory behind the primaries was to get the parties to have an internal contest to nominate their candidates in the style of a traditional primaries, in the style of Washington state’s primary system. However, Argentina’s political parties are mostly empty shells or personalist outfits ran by a single personality. None of the candidates for President faced any opposition within their coalition, and most candidates for Senate or the Chamber were also without opposition. Therefore, the primaries turned into a weird kind of “mock elections” before the actual elections on October 23. In these elections, each party issued a ballot of their own with their candidate(s) for president, senator, deputy and some other offices. Voters were allowed to cut these ballots and vote for one party for president, another party for senate and so forth. They could also vote for the same party for all offices. However, voters had only one vote for each office. They could not vote for two candidates for president, for example. Since every presidential candidate ran unopposed, when the votes cast in the “presidential primary”, it ends up exactly like the real election. However, nobody is elected in these primaries. Nobody is even qualified for a runoff or anything. The only thing which changes is those primary candidates who won less than 1.5% of the vote are excluded from the October ballot. It is thus an indicator of what will happen in October. If President Cristina Fernández de Kirchner won over 45% of the vote, it would indicate that she was heavily favoured going into the October elections. If she won less than that, it would mean she would open to a runoff in October. Furthermore, given the division of the opposition vote, a lot of people on the fence saw in these primaries the opportunity for one candidate to emerge as the best opponent, and they opposition vote would then coalesce around him. 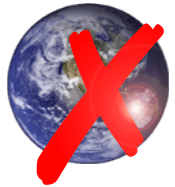 Some have said that those who don’t vote in August won’t be allowed to vote in October, a somewhat arbitrary and stupid idea, but there is controversy about that. It will likely be decided in a few months time. This is a good opportunity to quickly preview the presidential candidates, though a better preview will come in a few months time as the real elections draws closer. Candidates need 45% of the vote in the first round or at least 40% of the vote and a margin of 10% from the second-placed candidate to win by the first round. Cristina won 45.3% in 2007, and the runner-up won 23%. President Cristina Fernández de Kirchner, elected in 2007 and widow of former President Néstor Kirchner, is heavily favoured to win reelection in October. After a tough first term, in which she became unpopular after a bad spat with farmers over an increase in export taxes on soybeans and sunflowers, and later lost her majority in the legislature, she rebounded thanks to Argentina’s rapid economic growth and strong economy but also sympathy following the 2010 death of her husband, Néstor Kirchner, originally thought to be eyeing a return to power in 2011. She has proved the nay-sayers who thought that she would be a weak president or a stand-in puppet for her husband wrong. The Kirchners, in power since 2003, represent the left-wing faction of Argentina’s dominant ideology, Peronism and of the Peronist party, the Justicialist Party (PJ). Kirchnerism rejects the neo-liberalism of the Carlos Menem years (Menem was a Peronist), instead favouring industrial developmentalism. It also opposes multilateral and bilateral free trade with the US and the FTAA agreement. The Kirchnerist party is the Front for Victory (FPV), formally a faction of the PJ. Her running-mate is finance minister Amado Boudou. Ricardo Alfonsín, the son of former President Raul Alfonsín (the first post-military President of Argentina in the 1980s), is the candidate of a coalition assembled around the Civic Radical Union (UCR). The UCR, Argentina’s liberal middle-class party, is Argentina’s oldest party but since then have been badly split and severely trounced in a lot of elections. As always with the UCR, Alfonsín has tried to reach out to both socialists and right-wingers, but has mostly tacked to the right, notably with his running-mate, Javier Gonzalez Fraga, a strong supporter of Menem. The other main opposition candidate is former President Eduardo Duhalde (2002-2003), who became popular as President for slowly restoring Argentina’s economy following the 2001 crisis. Duhalde was the one who picked Santa Cruz Governor Néstor Kirchner to succeed him in 2003, and was originally allied with him, until Kirchner showed his ambitions of his own and made sure Duhalde would not run to get his old job back in 2007. Since then, Duhalde, a Peronist, has aligned with the right-wing faction of Peronism, Federal Peronism. He has thus become a de-facto right-winger. His running-mate is the former federal Peronist governor of Chubut, Mario Das Neves. The third opposition candidate is Hermes Binner of the Socialist Party (PS), which in Argentina has aligned with the anti-Peronist opposition, often alongside the UCR. Binner was a popular mayor of Rosario and then governor of Santa Fe until 2011. In Santa Fe’s gubernatorial elections in late July, PS candidate Antonio Bonfatti narrowly defeated PRO (right-wing) candidate Miguel del Sel, a nice boost for Binner’s campaign. Federal Peronism also features another candidate, Alberto Rodríguez Saá, the governor of San Luis since 2003. His brother Adolfo served as President for seven days in 2007 and has been senator since 2005 (he also ran for president in 2003). Rodríguez Saá is insanely popular in San Luis, which he won with 68.2% in 2007, when he ran for president winning 7.6%. Rodríguez Saá, a conservative Peronist, has a powerful local base in San Luis, but is weak outside San Luis and some surrounding provinces and districts. Elisa Carrió, who is basically a middle-class liberal, ran second to Cristina in 2007 with 23% and notably carried the city of Buenos Aires, is running again. However, Carrió is a bit of a weird personality and she has lost most of her support since 2007. Her Civic Coalition, which ran with the UCR in most provinces in the 2009 legislative elections, has totally collapsed into near-oblivion propped up only by a handful of strong personalities. Here are the quasi-final primary results. Argumendo, Pastore and Bonacci won under 1.5% and will not be allowed to run in October. Cristina not only won over 45%, she won over 50%, an extremely symbolic point. Her landslide in these mock elections make her pretty invincible in October, unless there is some major crisis which makes her unpopular all of her sudden. It will demoralize the opposition, which thought that perhaps Cristina wasn’t so unassailable after her candidate lost badly in Buenos Aires’ elections in July and then a poor performance by the FPV’s candidate in the Santa Fe gubernatorial elections. To further destroy the opposition, none of their candidates has emerged as the undisputed strongest candidate. Alfonsín and Duhale ended up statistically tied, with Binner only a few points behind both of them. Even Rodríguez Saá performed decently. The chances of the anti-K vote coalescing around any of the four top opposition candidates are low. Lower yet are the chances of any of the four dropping out. One of the main reasons why this is is that, like in these primaries, the elections in October will use separate ballots for each party. Thus, voters who wish to vote for one party for president but another for Congress must cut their ballot. If a party has no candidate for President, a lot of voters who might vote for the other candidates from this party will not because they won’t take the time to play origami with ballots. If the opposition, for example, coalesces around Duhalde, the UCR and PS will have no candidates for President and those who want to vote UCR or PS for Congress are more unlikely to do so because they won’t take the time to split their paper. Therefore, a candidate dropping out would sink their party’s other candidates for lower office. If, like it happened in two recent gubernatorial contests, a single ballot is used (like in the US), then it will be easier for candidates to drop out. But the fact that all are basically tied, it is hard for one to emerge as the top candidate of the anti-K front let alone strong enough to push others to drop out. Cristina landslided all provinces, except San Luis, where Rodríguez Saá won 52.4% to Cristina’s 28.5%. She most notably won the anti-Peronist stronghold of Buenos Aires (city) with 30.1% against Duhalde’s 22.1%. The strength of each opposition candidate varied regionally. Duhalde was the strongest of them in the city of Buenos Aires (he is quite close to the city’s head of government, PRO’s Mauricio Macri) and the province of Buenos Aires though with a paltry 13.9% to Cristina’s 53.1%. In Chubut, where is running mate was governor until this year, he won 26.3%. Outside there, he was in the single digits in most rural Peronist strongholds in the north. 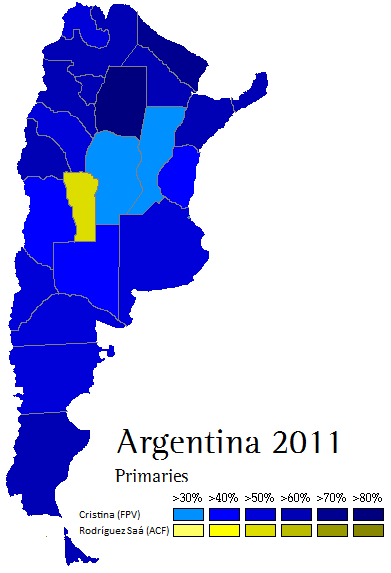 Binner won 32.8% in Santa Fe and was somewhat strong in surrounding provinces and the city of Buenos Aires, but quite weak in a lot of northern provinces. Rodríguez Saá placed a distant second in San Juan, Mendoza and La Rioja, which all border San Luis. Alfonsín was strong in pretty much all other provinces, which might make him the least-worst of the opposition candidates in terms of electability. Carrió won 6% in the city of Buenos Aires and did badly outside of there. These primaries were an interesting experiment and a great ‘mock election’ which doesn’t count for anything for electoral nerds, but in practice it was a waste of time and money. Primaries are not made for a country like Argentina, which has no real political parties, given that all politicians are attention-whores who don’t stomach losing fights with ‘fellow’ party members. Argentina instead has parties which serve as temporary labels for parties and are hardly more than French Third Republic parliamentary groups. The PJ split into factions in 2002 and hardly resembles a political party. The Federal Peronists, furthermore, are split between various persons, such as Duhalde or Rodríguez Saá. The UCR has been an empty shell for quite some time. Most other parties are labels created by various attention-whores to run for president or other offices. Primaries can’t work in such a system where everybody just forms his own party to run anyway.